Pentacle Knot - as with other knotwork designs, the magical weaving of an unbroken line was believed to form gateless protection, and as a protection symbol, the pentagram is used as a magic charm within many ancient cultures. 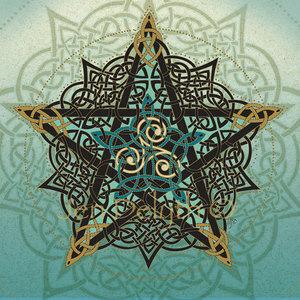 The five pointed star represents the sign of man/woman, connecting the five body-mind elements together. A mystical combination of points and circles, male and female, the pentacle interlaced with five rings creates a flower and star pattern, representing earth and heaven.